Median value increased from 2004 - 2007. During the financial crisis years of 2008 and 2009 median value declined by less than 3%. From 2011 to 2014 values have increased a hefty 28%. Appreciation has been driven by a lack of inventory and buyer demand driven by low mortgage interest rates and an improved local economy. The number of sales increased from 2004 - 2006, mirroring the growth in inventory. During the financial crisis years of 2008 and 2009 the number of sales decreased. Although inventory has fallen the number of sales increased from 2010 - 2013. This is an indication that demand for condos remain strong. The number of units on the market from 2005 - 2008 was inflated by several large condo projects, such as Regatta Riverview, Glass Factory, and One First. Once these projects sold out development activity greatly slowed leading to a significant reduction in inventory. 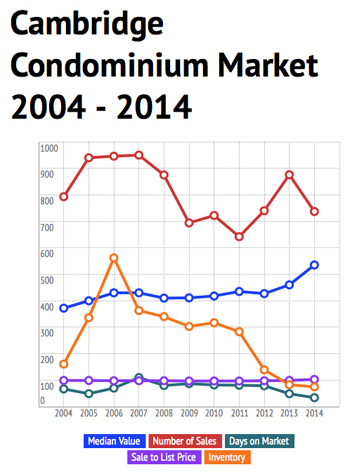 The number of condo units on the market on May 20, 2014 was down an incredible <b>86.8%</b> from May 20, 2006. The condominium market has been in an appreciating cycle since 2008. The current market is a seller's market with historically low inventory levels. Demand is exceeding supply with multiple offers significantly over asking price occurring frequently.